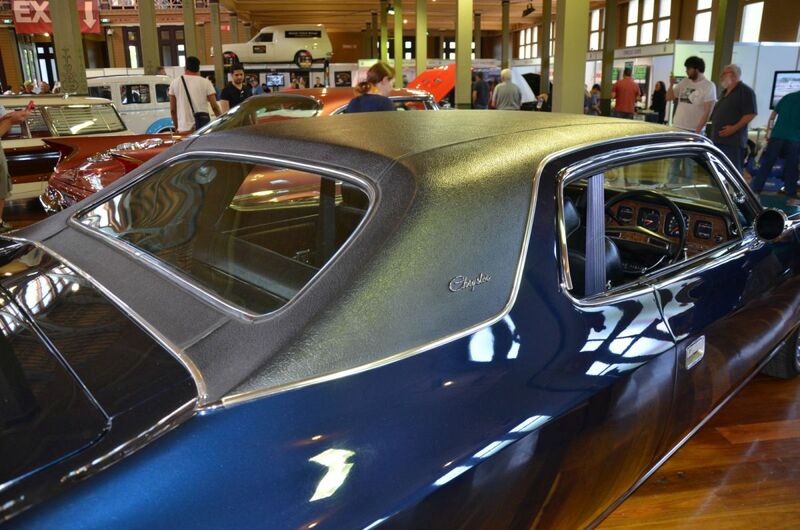 As a change of pace from coverage of Motorclassica, here is an in-depth look at one of the rarer cars on show, the 1972 Chrysler by Chrysler Hardtop. 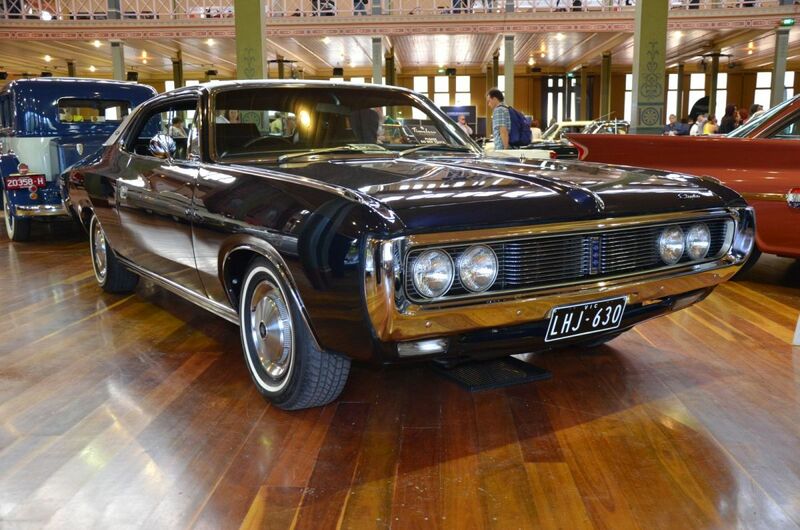 This car comes from before the peak-Brougham era, although after the Brougham died – the Holden Brougham that is! If that sounds mixed up, so are my feelings for this car. On one hand it is a car that arguably should not have been built, as it was only at the insistence of the North American managers at Chrysler Australia and Highland Park that a long-wheelbase coupe was made for a market that was resolutely committed to sedans. Perhaps the previous generation hardtop that had a 3” longer wheelbase than its sedan cousin (111” vs 108”) may have had an influence however that was simply a matter of expediency because it used imported Dodge Dart hardtop body panels, rather than a deliberate strategy. Now before we go further, I think it is worth re-setting your perception of what a Valiant was in Australia. 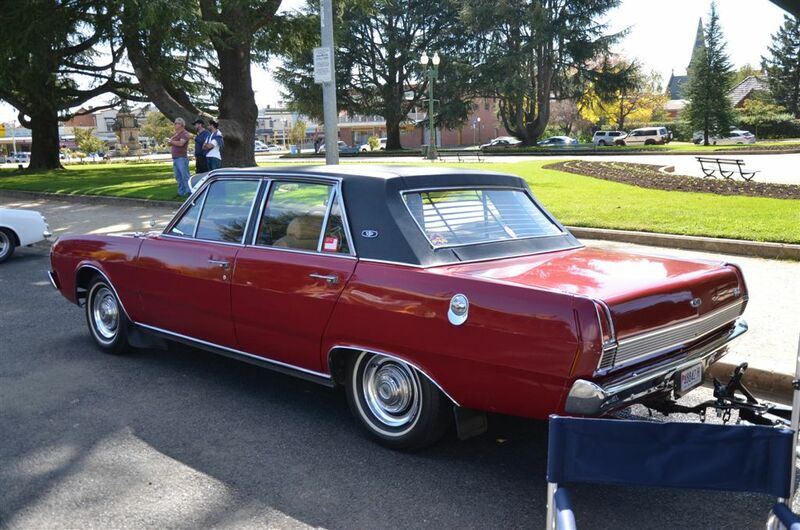 The Chrysler, not Plymouth, Valiant was positioned above the competing Holden and Falcon right from its debut in January 1962 with the 145hp 225ci slant six against the 75hp 138ci Holden and 85hp 144ci Falcon. In 1965 Chrysler introduced the first V8 in the class a year ahead of Ford and two years ahead of Holden. 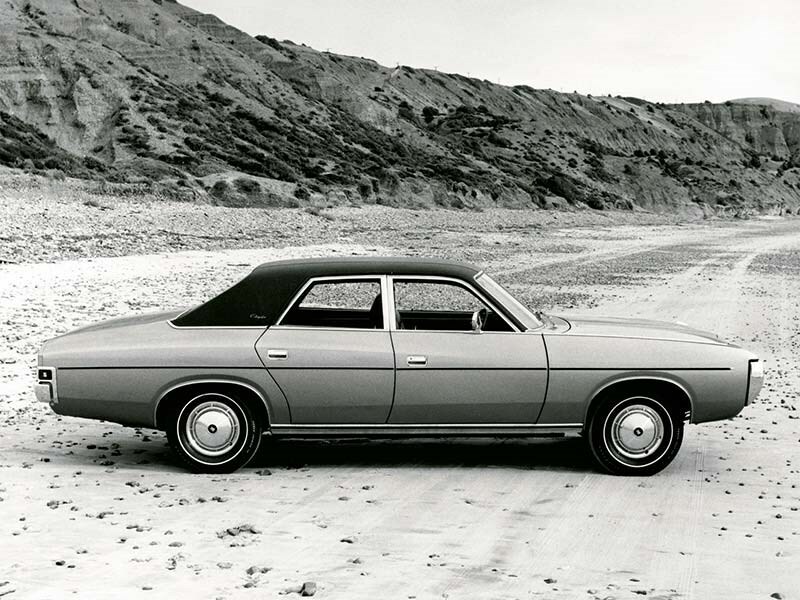 In 1969 the new Chrysler VIP ventured into Brougham territory, or perhaps more accurately Ford Fairlane territory with a 6” wheelbase stretch to 114”. Of course all this while you could still get a bare bones hose-out interior base model as well as a workhorse ute, and Chrysler was playing the performance game with the Pacer that featured warmed versions of the sixes. 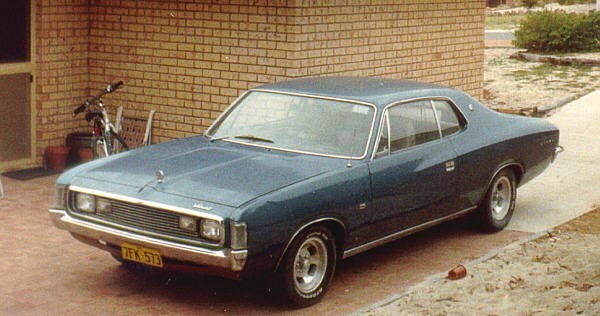 The Australian-designed VH Valiant of 1971 obviously took a lot of inspiration from the Fuselage Chryslers in the US although with a more defined hip line, and was larger than the previous car in wheelbase by 3” (to 111”), width by 4” (74.2”) and surprisingly just ½” more length – but thanks to the more voluptuous bodywork it actually looks quite a bit longer. The local Hemi 6-cylinder could be had in 215, 245 and a new 265ci capacity in addition to 318 and 360 V8s. 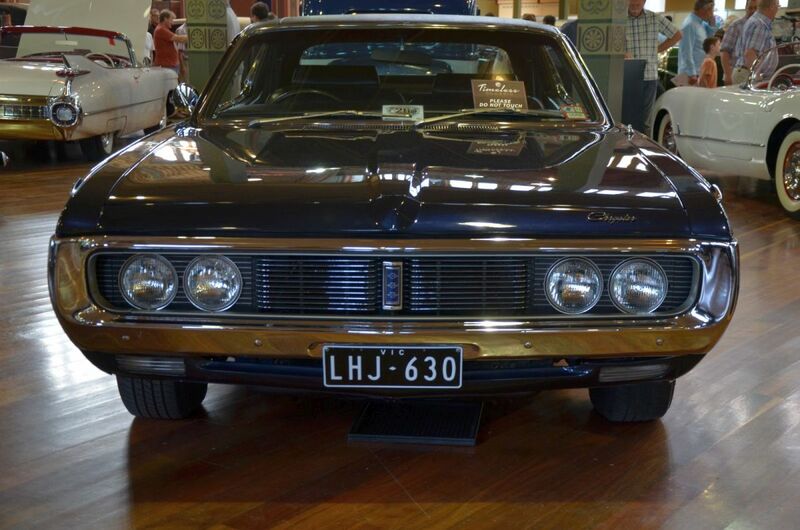 The Chrysler by Chrysler that replaced the upscale VIP was built on a 115” wheelbase, up 4” from the standard Valiant, with an overall length of a trim 196.6” (just over the 5 metre mark). The hardtop’s weight was 90lb lighter than the sedan’s 3670lb (including 100lb of optional air conditioning that was surely specified by most owners). If you opted for the 265 six instead of the 360 V8, in addition to fuel you would also save 200lb of cast iron. Either way you had a 23 US gal fuel tank and 31 cu ft trunk (at least according to the manufacturers specs, it seems rather large!). The Chrysler by Chrysler had a full-loop bumper and standard vinyl roof with a smaller rear window. On the hardtop the vinyl roof had a strip of body colour above the doors, sweeping back for quite a unique appearance. The purple is a signature Mopar colour, but would have been an unusual choice in 1972 Australia. Inside there were all the goodies as you might expect, with brocade trim, power steering, pull door straps, power windows and mirrors, aircraft-style reading lights and a special instrument panel clad with would you believe Carpathian elm! Options were air conditioning, power seat adjustment and Searchtune radio with stereo cassette. 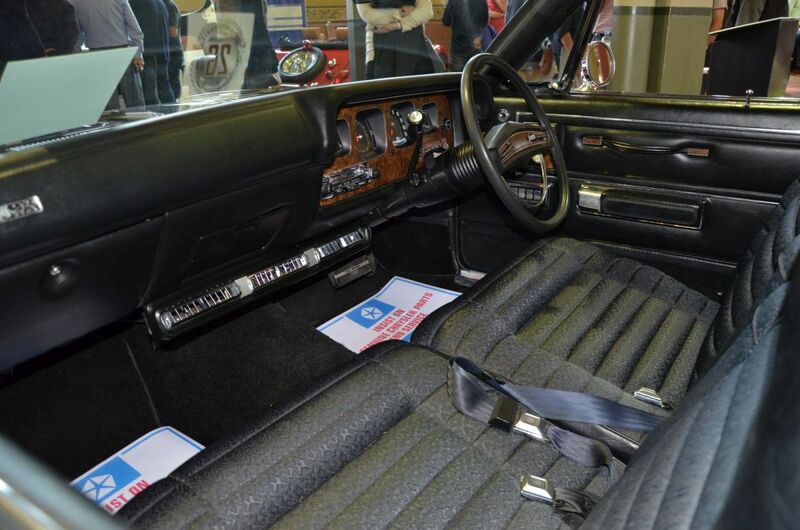 The underdash air conditioning vents betray the lack of flow-through ventilation which was a weakness for a 1971 car. The rear seat shows similar accommodations, although the seat cushion looks on the short side. You can also see where the retractor is located for the lap-sash seat belt. Seat belt use was first made compulsory in the state of Victoria in 1970 (in the front seats at least). 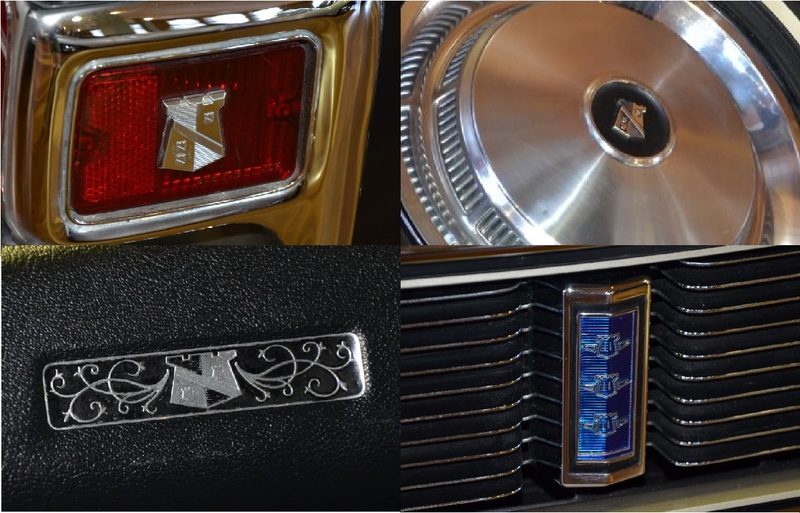 Of course, befitting a Brougham-style car there were a lot of shield emblems. While the difference between the items on the rear tail light sides, wheel covers and dashboard might be explained by the lesser height of the latter, the grille divider features a different style that looks more like those on a Hillman or Singer that featured the three spires of Coventry’s cathedrals. I mentioned having mixed feelings for this car. While I am more inclined to think the Hardtop was an unnecessary distraction or waste of Chrysler’s scarce resources, because the Chrysler by Chrysler version sold only 480 units in addition to just 1970 other Valiant Hardtops from 1971-75. On the other hand it is always interesting to see a car being taken in a unique direction, not to mention this beautifully restored example, with its only competitor being the Ford Landau. Overall this beautifully restored example makes for an interesting piece of history if nothing else. Next: back out into the sunshine to see an incredible variety of cars brought along by various car clubs. Some of the cars pictured seem to resemble a late 60’s Ford Fairlane/ Torino. I was just going to mention that. It’s like a Ford built by Chrysler. I never understood these cars. 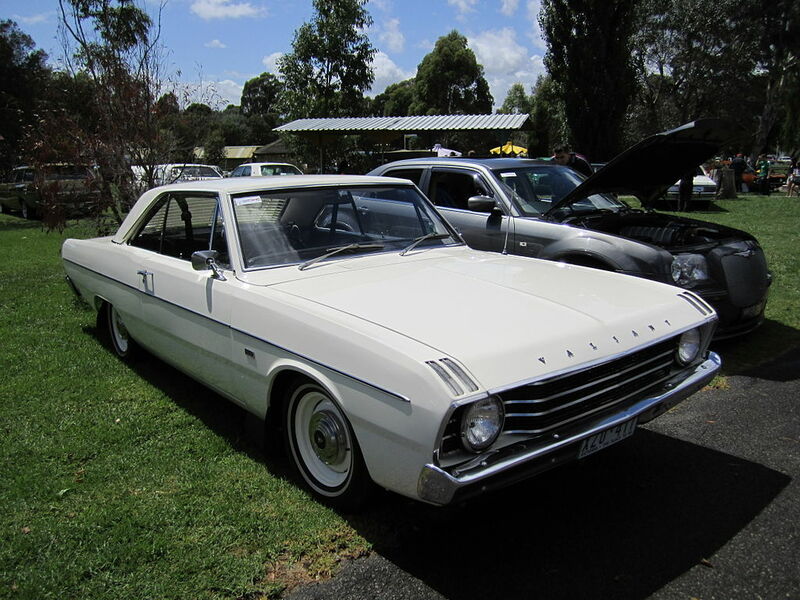 On an academic level they were an interesting exercise for the Australian market – a Fairlane-size coupe, of all things! – but I could never understand who Chrysler expected would buy such a thing. I remember my reaction when I saw it on a magazine cover: “Oh no!”. And if a car-crazy teenage schoolboy from Melbourne can’t imagine anyone buying such a car, then what was Chrysler thinking? I still don’t understand how nobody within Chrysler Australia had the gumption to take the American managers aside and say “Look, this thing will be a disaster”. I never saw one of these outside of a magazine. Still haven’t seen a real one. The Valiant version was also a rare sight. The short-wheelbase Charger, however, seemed to outsell the sedans. Then there’s the curious/weird/ugly vinyl roof treatment…. Oh, and one typo – the old Holden six was 138 inches, not 128. I’m not sure that they didn’t try to get the point across, who knows? Surely looking at sales stats of other coupes, or even the fact that there weren’t any other similar cars on sale in any real numbers should have been a clue. I see a lot of AMC in it, right down to the instrument panel. OK, I’ll bite: why was it called Chrysler by Chrysler? The car has a sort if AMC vibe to me. Not unattractive, though. I suspect it might have been an attempt to differentiate it from the other offerings – just as the Brougham was by General Motors (there was not a Holden badge on it – good luck finding the monogramed wheelcovers if you need them). My understanding is that the 2 door CxC was intended primarily for South Africa. The classiest ingredient of Broughamity is actually missing from this car – the Paisley embossed vinyl roof. I’ve even seen one in green. Very low volume special-ness! As a bit of a hippie I always liked the paisley vinyl, but buyers in that class evidently didn’t. The “not a Holden badge on it” sounds similar to the Hyundai Equus. It can be ordered with only “Equus” badging and not a Hyundai logo anywhere on the car, so snobby folks who see the car and look for a badge will not associate it with the cheaper Hyundais one sees. Was the Chrysler by Chrysler only available for the VH Valiant, or was it available for later Chrysler Valiants? Later VJ & VK had that trim level then it died out I think the coupes died early I’m not even sure many VJs were even built it was a real slow selling body style. It’s too bad. They all were good looking cars. Except for the taillights, the car was a very nice looking car. Thank you. I’ll check it out. I’ve heard of the Chrysler by Chrysler, but because I’ve never lived in Australia, or even visited Australia, I’ve never seen one in person. Chrysler by Chrysler, we also had Statesman by General Motors no Holden badges showing plus for Kiwis and South Africans Statesman by Chevrolet same body as the Aussie Holden version but with all Chevrolet powertrain 350 THM400 and 12 bolt rear axle, just to confuse you. There was a recent article in Collectible Automobile who mentionned then they studied others names like New Yorker and Imperial but it wasn’t familiar to Australian buyers or even continuing with VIP monicker but gived the low sales of this one; they thought of trying Chrysler by Chrysler. Before these, the last ‘Chrysler’ we had was the Royal, which was essentially replaced by the ‘Valiant’ R-series (US 1960 ‘Plymouth’ Valiant). 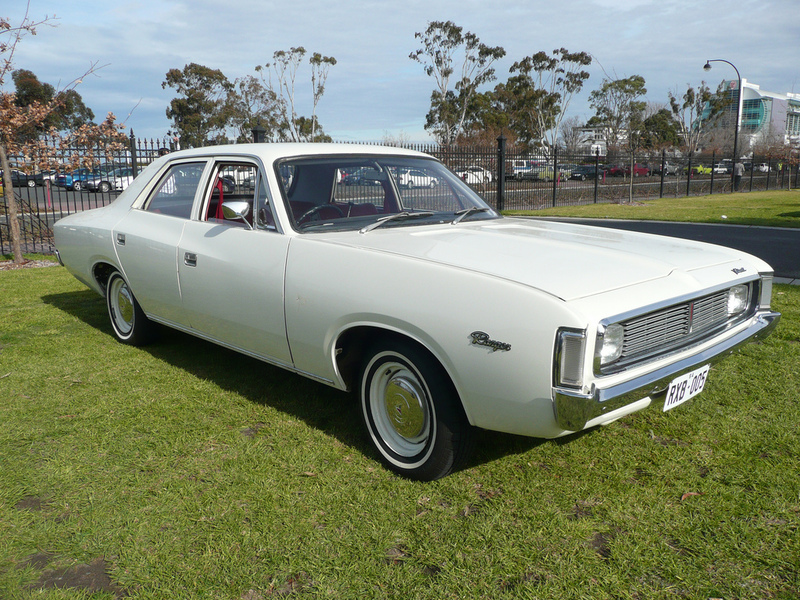 From then on until the VH/CH series, the smaller marque was known as ‘Valiant’, which ran alongside the larger ‘Dodge’, both being marques of Chrysler Australia Ltd. Please don’t take this pathetic explanation as an excuse. That’s a very handsome two door coupe, especially in the dark colour. It’s a shame Chrysler didn’t bring it to North America. It would have been a great alternative to its overtsyled fuselage intermediates. +1,i was horrified when the bloated 71 B bodies were shown after the gorgeous 68 – 70 models. Johnh: fantastic write-up and excellent photos! I can’t remember the last time I saw a C-by-C coupe, although I see the odd Regal coupe and C-by-C sedan around. As a kid I hated the overall styling of the VJ/CJ-VK/CK Valiants, finding them all a bit creepy and stretched-slug-like. Aren’t we irrational as kids sometimes lol! The C-by-C front end was okay though, as its loop bumper was distinctive and attractive. But over the past few years reading CC, I’ve grown to understand the Val/C-by-C exterior styling in the context of Chrysler’s American Fuselage design language (which I always liked). Nowadays I enjoy seeing them around, and finding a C-by-C coupe in the metal would be awesome! But until then I’ll enjoy the beauty pictured above! OK, I’ll own up to it. My first car was a CJ CxC, municipal pool blue with a parchment vinyl roof and the 360. The die cast grille was near to impossible to find back then in a decade beginning with an 8. The centre ornament has always been pure unobtainium. Anyways, the expediency of the builder with their shared components (CxC sedan used the wagon pan) has meant some interesting customs are out there. There was for a time a short wheelbase Charger with the CxC front clip and loop bumper nearby to me, and it really worked well. The effect might have been better if the transplanting Frankenstein had the aforementioned grille at hand, but I could well understand its absence. CxC sent me broke really fast, and the situation has not improved greatly some 9 cars and 30 years later. I did like my VG VIP much better, just for the record. I can theres a shed full of Valiants nearby and of course it houses a couple of these it seems only the NZ version featured loose pillow upholstery as John didnt mention it and this plainly shows the mix n match parts used to produce the 770 camper front, these long coupe’s didnt have much of a following from my observations in OZ a friend picked up a tidy one for some $700 265 motor and all, another mate ran one for a couple of years eventually changing to V8 Falcon coup’es as the price of thoswe fell into dunga values, of course now they’ve skyrocketed again. I think you must be right Bryce, the guy had a brochure on show and it didn’t reveal any loose pillow upholstery. The ‘loop’ bumper is one piece on these too by the way. There were two C-by-C sedans in my little town, one with a non-factory lower-body side chrome strip providing the break for a blue over silver paint job. Yeah, with the black vinyl roof. Have to go out with my camera. The final head-on shot shows the NA mopar kinship quite clearly–it’s nearly a dead ringer for an early 70’s Dodge Charger. That ’71 VH sedan in white is a nice looker. Like the fender sweep and front end treatment. The ’71 VH sedan is my cup of tea. A mini fuselage, and much better proportioned than the B-body sedan Americans got around the same time. Not all that mini, actually. It’s one of those cars that looks bigger than it actually is – and that worked against it in seventies Australia. When the VH came out, there was already a feeling that the average Australian car was getting too big. About ’75 Chrysler Australia sent some to the US for Mother Mopar to tune the suspension, only to be told it was the best handling intermediate they’d ever driven. Check those dimensions mate – that thing’s a compact! I’d love to have one, just to drive around and confuse people. Of course, nowadays most don’t recognize cars this old anyway. So yes, I’d have liked to have had one in about 1975. The plain white sedan, with “Hemi” badges on the fenders. The front of this car is so weird. It looks like a Chrysler, Ford and Oldsmobile. 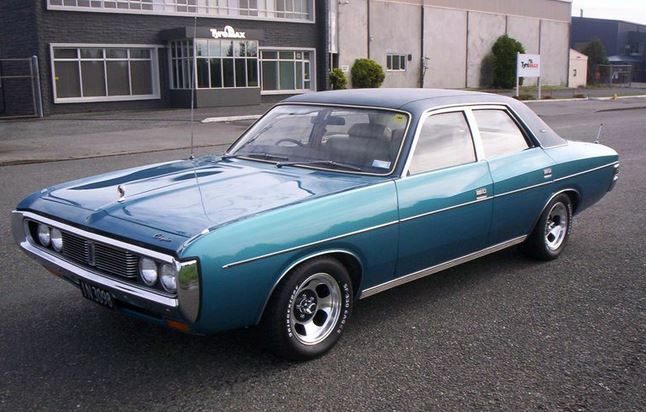 Too bad the US Valiant/Dart did not migrate to the above Australian design in the mid-seventies. This could have prevented the Volare/Aspen debacle. I have always been a fuselage groupie!! Make mine the sedan, dark blue paint and a HEMI engine!!! True, but by the later seventies they would have been locked in to that dated-looking body anyway, like Chrysler Australia was here. By then the Volare/Aspen body looked a lot more modern – I’m talking aesthetics here, not build quality! As an aside, Chrysler Australia ran a TV ad in the late seventies showing a family on vacation packing all their luggage into that Valiant’s huge trunk, with Ol’ Blue Eyes singing “For The Good Times”. 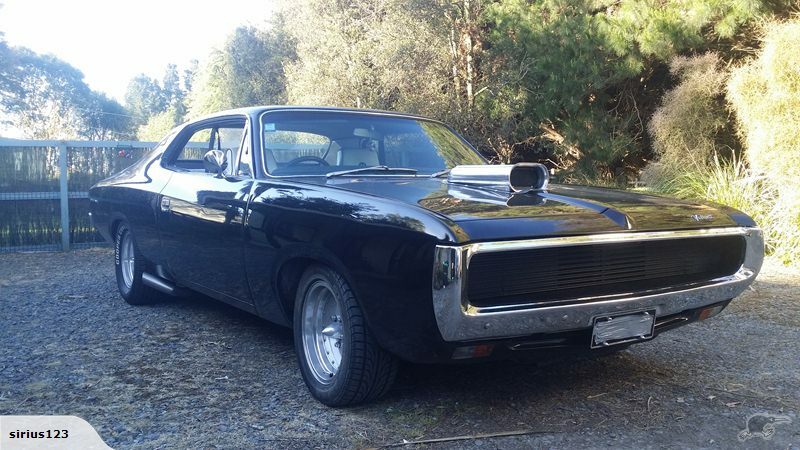 That very first pic…it kinda looks like a ’69 Pontiac around the gills. And that vinyl roof with the strip of bare color around it? My brother’s ’71 Torino had that same exact vinyl roof style…never saw it anywhere else. Another vote for the 114″ wb VH being the car the ’71-78 B-bodies should’ve been. This looks certainly better than the Landau. You need to make one on the Aussie Charger. I’ve seen some restored ones and it was love at first sight. Specially when using slotted mags. I have to go with Jim’s coments above. As a kid frim Sydney, growing up in the eighties, i saw a lot of the old Valiants around. Hardly ever spotted a CxC but then, it wouldn’t have excited me. In contrast to the nicely packaged styling of the 71 to 80 Holden or the 72 to 79 Falcon, the 71 to 81 Valiants really looked dismal to my eyes. the windows were too small, the sides were too high and the doorhandles looked like a silly afterthought. 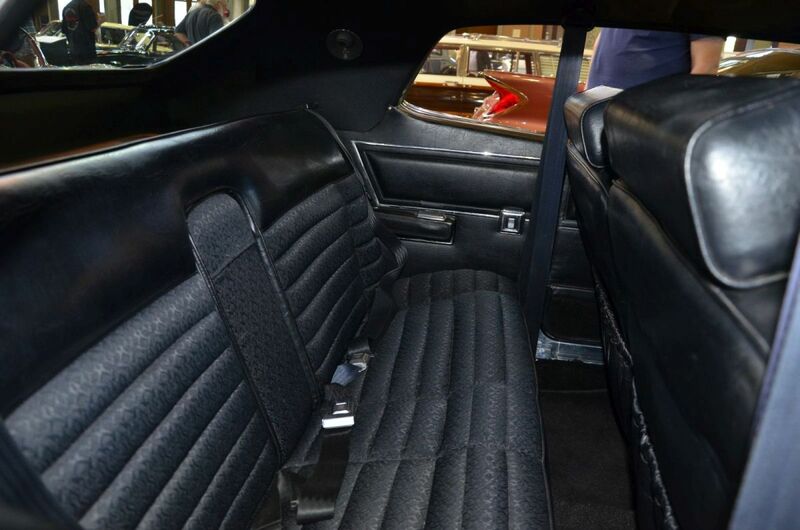 The rear panel looked as if it was frowning or just very sad and the interior was just…..bleak. I’d have a Falcon over this, any day. The 77 to 81 models were the last ditch effort to improve the saleability of the car, but still there was too much of the grouchy old car in there and most buyers bought something else. Yes! I called it creepy with stretched-slug styling, but you’ve nailed it there Doug; that’s exactly what I thought as a kid! Hahaha, nice shoutout to Melbourne’s downmarket ethnic suburbs. I spent my uni years near that part of the city. Monaros were the top-dog hoonmobile. My parents had a 70 VG Valiant sedan. I remember a wheezing motor and uncomfortable bench seats. We then lived in the US for a while and had a 71 Dodge Dart; the family resemblance was strong. I rather like the VH Valiant nose treatment. I find myself wondering how it would look with concealed headlights. I’ve always liked Australian cars. If only they were built today in Australia, by Australia, for Australian road conditions. This is priceless. Mr. Iacocca was rather famous for pulling up at the White House or the Capital when he was trying the save Chrysler in an Omnirizon. The PR point was that Chrysler was all over modern fuel efficient cars. Where are you, Mr. Iacocca, when America needs you? The sales numbers cannot be denied, this was wrong for the AU market, but this may have been the perfect mid-size coupe that the Chrysler brand should have introduced in the U.S. by the late ’60s. Good point – the loop front bumper treatment looks a lot like the Plymouth Satellite coupes of the early 1970s in North America. I love the 2 door versions. Especially the second picture down with the aluminum slot mags and RWL tires. My ’72 Pinto has those same wheels, they were a dealer option. Made by Appliance. Unfortunately finding 13″ tires has become nearly impossible, unless you want to pay $300 each from Coker Tire. They were a dealer/factory fit on some Valiants too, and standard on the Charger R/T’s intended to see race duty. They were made by Aunger in Adelaide among others, and would most commonly be found in 14″ size. My Uncle’s XB Falcon had mags that looked like those; they were Aunger. I assume that, like Hotwires, the jellybean mags were a fairly standard design that everybody did a version of! Looking at the first picture, I seem to detect a bit of GM-influenced styling. Both Pontiac and Olds. I see this, had it been available in the States, as somewhat of a competitor to a loaded Pontiac Grand Prix. I say that when looking at picture seven. And, picture twelve, the front view, with the headlights inside the loop bumper, seems GM-like. More like a Pontiac. I kind of like it, and seems like something like this might have worked for us prior to the Cordoba (and very similar Charger SE). Are you sure? The one johnh photographed looks like a single piece loop, and the CxC sedan local to me (and still with its original owners) looks like a single piece too. I like the wagons (a lot), the utes and the Chargers, but I think the sedans and hardtops missed in the profile proportioning. My ideal 70s mongrel would be a CH-frontclip wagon. Loving it, John. Keep them coming. I have seen wagons with the CH front – it was a popular swap for hearse-builders. Similarly the Fairlane/LTD front clip was popular here on Falcon hearses from XA to BA. Oddly, don’t think I’ve ever seen a Kingswood hearse. plenty of Statesman one-tonners, but. Thousands of Premiers and Statemans were stolen for the front clip and doors The NRMA did a demo on channel 9 4 minutes to relieve a Holden of its luxury equipment then dump the remains.All thanks to the F body front arrangement. Waaait a minute, F-body? What have you been smoking? I lived in England in the early 1970’s when my Dad was transferred from Detroit to work for Chrysler UK. They tried selling these Australian Chryslers in the UK, which was a failure, no surprise, given their size. Dad had a 4-door one for a few months to “try it out” and I remember it being all but impossible to drive on anything but motorways and “dual carriageways” (2 lanes each direction). Somewhere I have a photo of it on a British “B” road on a family trip, door handles all but scraping the hedges on either side. I thought it was a huge car until we went home on home leave in 1973 and I encountered my grandfather’s 1972 Chrysler Newport! I can see that. Everything in England is small. The cars are small, the roads are small and the houses are extremely small compared to Norwegian standards. I cant see how this car wasn’t a hit. That blue/grey one up top looks like pure win to me. The slot mags give this a definite muscle car vibe yet the broughammy touches class it up just a bit. The gingerbread is very reserved, in fact the only thing Id be itching to get rid of is that wonky standup hood ornament. Having never been ‘down under’…why exactly is this sedan territory? Sedans are just basic family cars, whereas coupes with something under the hood are what you get excited about. Keep in mind Im a rabid Mad Max fan and my image of the Aussie/Kiwi car culture is one of Goose and Max slobbering all over the last of the V8 Interceptors, and the Holden Monaros. That and all those sweet utes you guys have. Those V8 interceptors never existed and while Monaros and 2 door Falcons and Valiant Chargers were sold in reasonable numbers the main sales in OZ are to fleets and citizens buy used ex fleet cars, Chargers were immensely popular in NZ as they won the Benson an Hedges standard production races 9 years running but they never had much racing success in OZ, though Alan Moffat got driving lessons when he brought his championship winning GTHO to NZ, he got beaten on our fast flowing circuits by Chargers those cars never seemed to grab the Aussies attention. A ute is a coup’e with a load bed thats what was really popular in OZ. Cars and fuel are more expensive in Australia. Through the 70’s I would say it would be more common than not to have single-car families (excluding working vehicles) – I’d need to do a bit of research into statistics there but it was true for a lot of people I grew up with. The Falcon and Monaro coupes ended up being dropped from the lineup and a special edition model being created to get rid of the last body shells (LS for Monaro, Cobra for Falcon). The Falcon hardtop sold under 20,000 total in 6 or so years, hence why even a badly rusted one is worth money now. Sweet looking car. I’ve seen pictures of the car, but they’ve always been in black and white, this is the first time I’ve seen the car in colour. I’ve also never seen a two door coupe version. How long was the “Chrysler by Chrysler” in production? I’ve never seen one of these before now, and I don’t get all the antipathy toward the styling–to me this is a handsome car, and I do especially like the unusual vinyl roof treatment. The lines are nice, interior is very classy-looking without being over-the-top Broughamy, and I think the concave rear panel with full-width reflector is a unique touch. Maybe it’s just american versus australian tastes, even 40 years after the fact! I do agree with you, but I would say there are two aspects to the comments on the styling. One is looking at the car itself, as a replacement for the old model. Here you see the more cave-like interior as the dash and window sill heights raised, the and the car is larger or more bloated. Most cars would be in comparison with the very square/sleek predecessor which had a large greenhouse. Then there is the comparison with the other cars on the market. 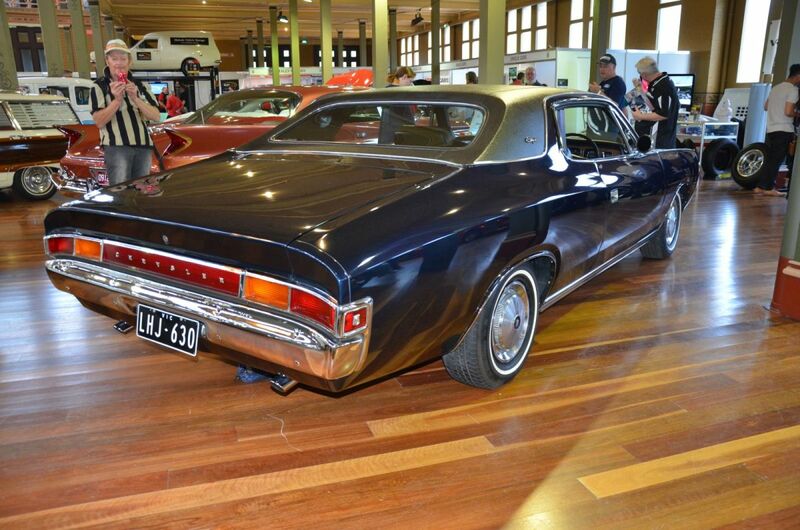 I have read the comment (in an article written about the 1972 XA Ford Falcon) that the HQ Holden looked smaller than it was (187.5″) with quite a lot of tumblehome to the side windows and a low sloping trunk, the VH Valiant looked larger than it was (192.8″) and the Falcon looked the size that it was (186.5″). They all had basically the same wheelbase and also width. Wheels often made that comment about the Falcon/Kingswood/Valitank styling. I certainly agreed with them as a kid; still do today. I’ve always wondered about the “X by X” naming convention. It seems obvious that it (except in this case) is to deemphasize the brand because either the brand is going to hurt the product or the product is going to hurt the brand. My dad’s 85 Riv was a “Riviera by Buick,” then there’s the “Cimarron by Cadillac,” the “Aurora by Oldsmobile,” and others. Is there a term for this naming convention? Or a history of it? I’ve done some cursory Googling but found nothing. Edit: somehow missed the earlier comments about the name, but I would love to try to figure out the history of this. Weird and inappropriate for the market, but the doors made the wonderful Valiant Charger a worthwhile proposition. Some thirty years I bought a 1972 coup hardtop, been in the garage since, love it only drive it once a year. Sweet looking car. I find it more attractive than the standard Chrysler VH Valiant.